Split Keyboards are designed to encourage neutral forearm posture which helps avoid the strain associated with standard computer keyboard usage. If you have a health condition like Repetitive Strain Injury (RSI) or Carpal Tunnel Syndrome (CTS) a Split Keyboard will help ease the discomfort so you can go about your work in a happier, more productive frame of mind. Opting to use an ergonomic split keyboard, over a standard keyboard, could also help you avoid developing musculoskeletal health conditions in the first place. Why Use A Split Keyboard? Standard keyboards can cause strain on the wrists and forearms because in order to use them you have to turn your arms inwards so your hands align with the flat keyboard keys. The pressure this posture creates can lead to Repetitive Strain Injury, Carpal Tunnel Syndrome, and a range of related musculoskeletal disorders. Split keyboards protect against this by encouraging an upright forearm and neutral wrist posture. They also allow the mouse to be positioned closer to the keyboard, which helps avoid injuries and discomfort associated with overreaching. Goldtouch split keyboards allow the keyboard to be continuously adjusted vertically and horizontally so you can find your neutral wrist position. 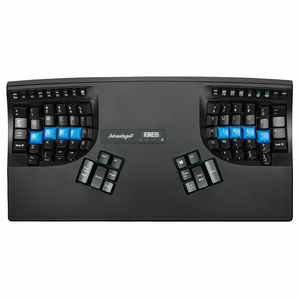 Because Goldtouch split keyboards are fully adjustable they can be set up to suit most users. Goldtouch Go!2 models are ideal for portable workers as they fold in half for ease of carriage. There are also both wired and wireless models available. Split keyboards offer a great option as an adjustable ergonomic keyboard, but the models which have an upright tenting facility work best for touch typists. 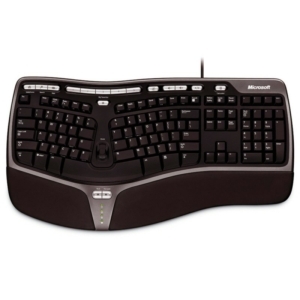 We have a range of non-adjustable split keyboards such as the Microsoft 4000 Keyboard and Microsoft Sculpt Keyboard which still encourage a more natural and neutral posture for non-touch-typists.